After receiving intense backlash from consumers, lawmakers, and health advocates over the skyrocketing price of emergency allergy treatment EpiPen — the costs increased as much as 600% in just nine years — pharmaceutical giant Mylan plans to cover some of that cost for certain patients. The company announced Thursday that it will take “immediate action” to ensure EpiPens Auto-Injectors — used to provide urgent treatment for allergy sufferers facing anaphylaxis — are more affordable for patients by expanding already existing programs that reduce out-of-pocket costs. Mylan says it will provide some patients with a savings card that will cover up to $300 for a two-pack of EpiPens. The drugmaker claims that for patients who were previously paying the full amount of the company’s list price for EpiPen, the savings card will essentially save them 50% in out-of-pocket costs. Mylan also is doubling the eligibility for its patient assistance program, which will eliminate out-of-pocket costs for uninsured and under-insured patients and families. Additionally, the company says that it will open a pathway so that patients can order their EpiPen injector directly from Mylan, reducing some costs. However, she believes, price is just one part of the problem. “All involved must also take steps to help meaningfully address the U.S. healthcare crisis, and we are committed to do our part to drive change in collaboration with policymakers, payors, patients and healthcare professionals,” she said. The company then goes on to tout the program it has put in place to help reduce the cost of EpiPen injectors. 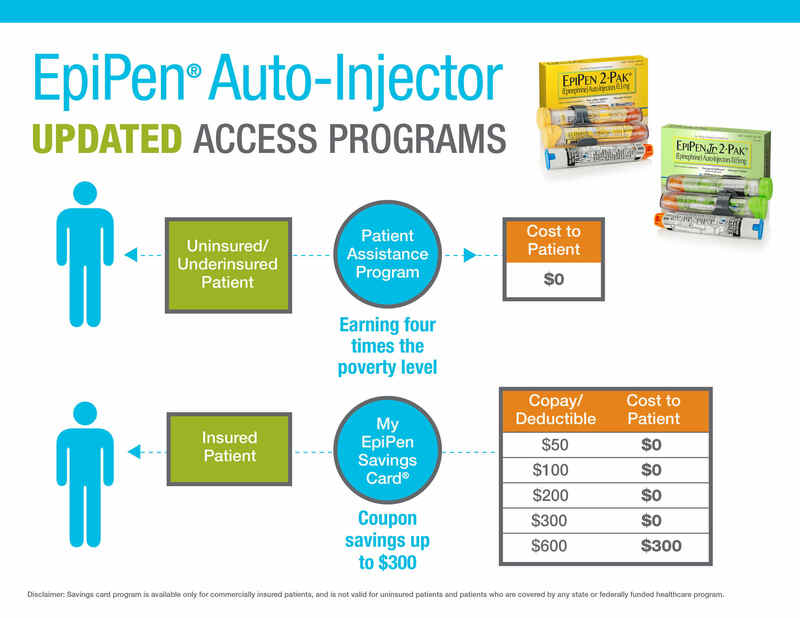 For instance, Mylan says that it has worked to help patients with commercial insurance pay as little as $0 for EpiPen Auto-Injector using the My EpiPen Savings Card. In 2015, the company claims that the program resulted in nearly 80% of patients using the card paying nothing out-of-pocket. 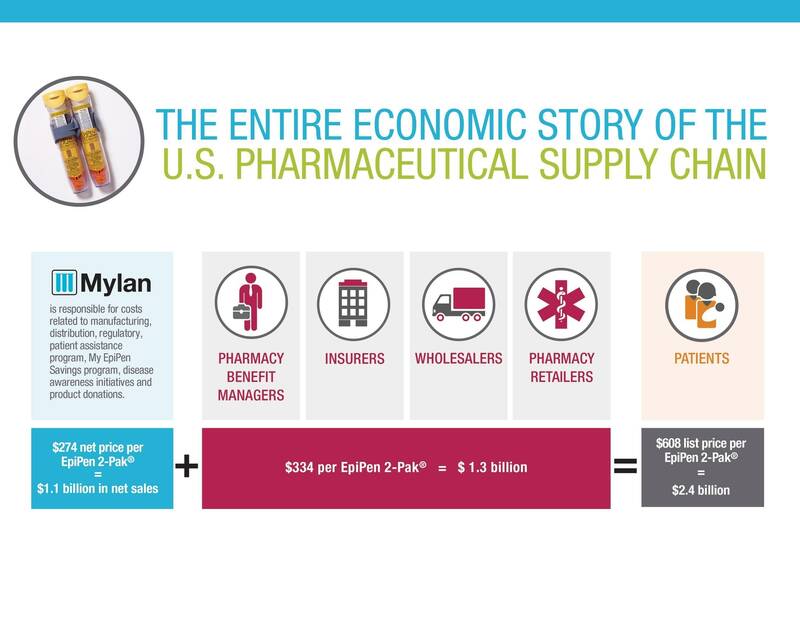 Mylan also released a “pharmaceutical supply chain” infographic on its website, describing the path the EpiPen injectors take to get to patients and the costs added to the medication. The graph appears to place a great deal of the price increase blame on the companies and individuals that bring the product to customers after it is created. For instance, Mylan says that the net price for a two-pack of EpiPens is $274 when it is manufactured by the company. After that, $334 is added to the cost because of pharmacy benefit managers, insurers, wholesalers, and pharmacy retailers taking their cuts. This leaves a total cost of $608 for patients. The backlash against EpiPen and Mylan comes on the heels of a number of price increases on vital drugs that have little or no competition in the marketplace. Like executives at some of these other drug companies, it’s expected that Mylan execs will soon be testifying before Congress about their justifications for the soaring price of the auto-injector.